Mum blithely sings, ‘Noodles for dinner, noodles for tea, noodles for you and noodles for me!’ as she rolls out the pasta from her new pasta-making machine. What hard work, turning the handle, but Mum says, ‘Never mind, I’ll soon have oodles of noodles.’ At these words, the machine takes on a life of its own, working faster and faster, producing long loops of noodles, completely wrapping up Mum, then slithering out under the door and down the road. When the noodles dance around the school playground, Lily and Ben realise Mum must be in trouble, and they race home. How does Ben save the day, and his Mum? 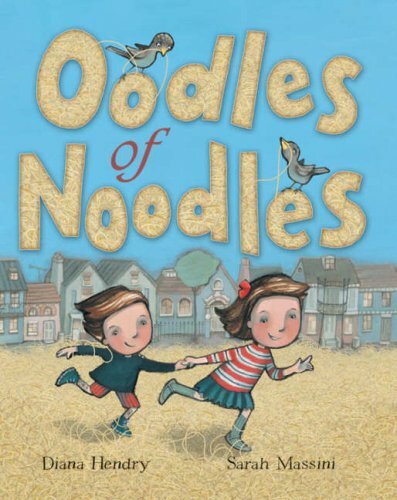 A funny story, illustrated with quirky, expressive figures, and… oodles of noodles on every page. The typescript gives lots of interest, changing in both size and font. Specific words are highlighted, helping the reader to read with great expression. And the story may well spark questions about the origins of pasta!